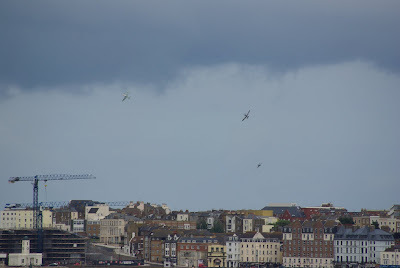 As a photographed the Me109 fly past back along the coast towards the west, followed by the Spitfires, a group of boys playing football didn’t even look-up, not even when the Lancaster swept by in the opposite direction towards the airshow. I was of course raised with the excitement engendered by the appearance of a Spitfire and remembering back to the making of ‘The Battle of Britain’ here in 1969, the thrill of seeing Messerschmitt 109s or Heinkel III bombers was almost too much to bear for a thirteen-year-old schoolboy. 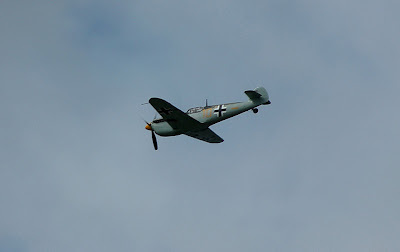 But this is a different era and why, as one passer-by commented when he observed the same as I did, we need to remember the events and the fragile aircraft of seventy years ago and the sacrifices that a generation made to keep us free. If the wind drops within manageable limits tomorrow, I’ll be airborne as scheduled but it’s a little too rough up there to risk towing a banner. The best analogy I can think of would be putting to sea in a rowing boat in the same conditions!